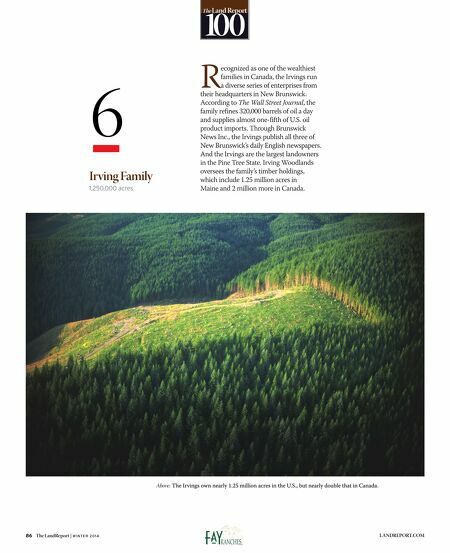 86 The LandReport | W I N T E R 2 0 1 4 LANDREPORT.COM The L and Report 100 Irving Family 1,250,000 acres R ecognized as one of the wealthiest families in Canada, the Irvings run a diverse series of enterprises from their headquarters in New Brunswick. According to The Wall Street Journal, the family refines 320,000 barrels of oil a day and supplies almost one-fifth of U.S. oil product imports. Through Brunswick News Inc., the Irvings publish all three of New Brunswick's daily English newspapers. 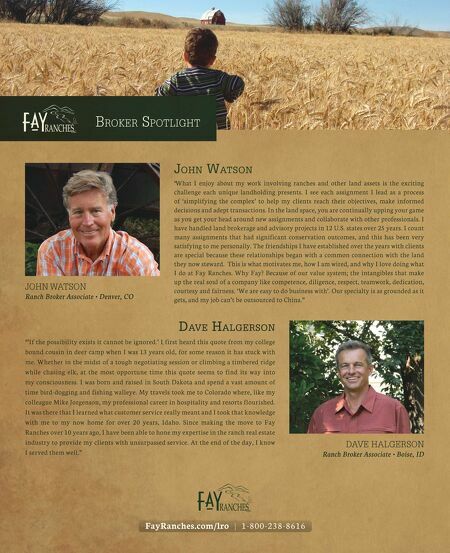 And the Irvings are the largest landowners in the Pine Tree State. Irving Woodlands oversees the family's timber holdings, which include 1.25 million acres in Maine and 2 million more in Canada. 6 Above: The Irvings own nearly 1.25 million acres in the U.S., but nearly double that in Canada.